Campanas at Cibolo Canyons is a gated community in the suburbs of San Antonio featuring Spanish-inspired architecture and lush native landscaping. The beautiful single-family homes and resort-style amenities are sure to appeal to homebuyers. Opened in 2008 by Sitterle Homes, Campanas at Cibolo Canyons is a tranquil enclave set within the larger, approximately 1,800-home Cibolo Canyons master-planned community. 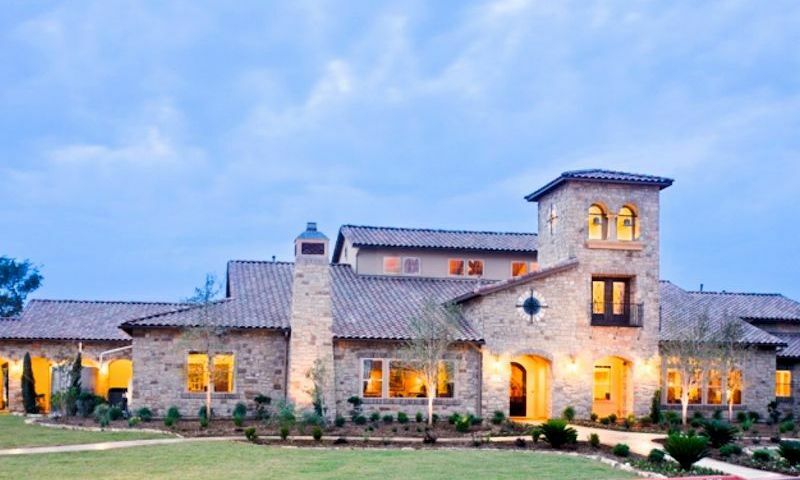 Upon completion, Campanas at Cibolo Canyons will host 300 single-family homes in a range of styles and sizes. As a gated neighborhood, Campanas has its own spacious clubhouse which features an exciting line-up of indoor and outdoor amenities. Residents also enjoy living within close proximity of the TPC Golf Resort, JW Marriott Hill Country Resort and the Stone Oak Hospital. When it comes to social and recreational activities, residents of Campanas at Cibolo Canyons can find plenty to do at the 10,000 square-foot community clubhouse. This impressive facility features many resort-style amenities to support an active lifestyle. Residents can stay in shape at the clubhouse fitness center. Socializing is easy with the clubhouse's TV and game room. Multi-purpose rooms can be used for more casual gatherings while a ballroom hosts larger, community-wide events. Residents can curl up with a good book in the cozy library, challenge friends to a game of billiards or share their love of cooking in the catering kitchen complete with dining room. Outdoors, Campanas at Cibolo Canyons features a beautiful resort-style swimming pool for lounging during the warmer months or swimming a few laps. The clubhouse patio and poolside gazebo are ideal places to enjoy a beautiful day with neighborhood friends while cooking a meal for friends with the outdoor kitchen. Campanas at Cibolo Canyons also offers a tennis court and a walking and biking trail for diversifying your exercise routine. The first single-family homes in Campanas at Cibolo Canyons were built in 2008 by Sitterle Homes and development is still underway with plans for a total of 300 residences. Homebuyers can currently choose from available resale and new construction homes. New construction homes are available in seven single-family floor plans, ranging in size from approximately 2,300 to over 3,300 square feet. These one-story homes are designed with two or three bedrooms, two to three bathrooms and an attached two or two-and-a-half-car garage. Spacious master bedroom suites include luxurious bathrooms and walk-in closets, while open kitchens feature island workspaces, sunny breakfast nooks and lead in to the living rooms that feature dramatically tall ceilings. Homes also highlight outdoor living with courtyards or covered patios. Though Campanas at Cibolo Canyons is open to all ages, it offers a lifestyle which appeals to homebuyers. As a gated community, the neighborhood offers added privacy and security. The spacious clubhouse provides a variety of amenities and plenty of space for socializing, while residents are also within close proximity of shops, restaurants and attractions such as the TPC Golf Resort. Keeping your social calendar full is simple as Campanas at Cibolo Canyons offers several social events ranging from a holiday bazaar to billiards to a fall celebration. Residents also take part in several groups and classes that keep them active including tennis, water aerobics, and yoga, while competitive sides are satisfied with friendly games of cards and billiards. Located in San Antonio, Texas, Campanas at Cibolo Canyons offers close proximity to many shops, restaurants and daily conveniences. The community is just minutes from retail centers, including well-known stores like Starbucks, Walgreens and Super Target, as well as shopping malls like Rolling Oaks Mall and The Forum. Residents can also enjoy date night or an evening with friends at the nearby Alamo Drafthouse Cinema. Within a 30 minute drive, Campanas at Cibolo Canyons residents can explore Downtown San Antonio and all its urban attractions including world-class shops, restaurants and the famed San Antonio Riverwalk. The community is also within easy access of nearby cities like New Braunfels, Seguin and San Marcos, and only 90 minutes from Austin. Those who frequently travel or have out-of-town guests will also enjoy living just 30 minutes from the San Antonio International Airport. Any homebuyers looking in the San Antonio area will love the amenities, well-built homes and picturesque scenery in Campanas at Cibolo Canyons. Clubhouse - 10,000 Sq. Ft. There are plenty of activities available in Campanas at Cibolo Canyons. Here is a sample of some of the clubs, activities and classes offered here. New construction and resale homes are available in seven single-family floor plans, ranging in size from 2,356 to 3,348 square feet. These one-story homes are designed with two or three bedrooms, two to three bathrooms and an attached two or two-and-a-half-car garage. Spacious master bedroom suites include luxurious bathrooms and walk-in closets, while open kitchens feature island workspaces and sunny breakfast nooks. Homes also highlight outdoor living with courtyards or enclosed patios. We've lived in the San Antonio area our whole lives and love how unique and one-of-a-kind this community is. The homes and the clubhouse at Campanas are so beautifully designed and are really something you don't see very often. It's not the same old thing you see at so many other communities. The architecture and design is what really makes Campanas stand out. The location is great too, close to shops and restaurants plus only about a half hour from downtown. 55places.com is not affiliated with the developer(s) or homeowners association of Campanas at Cibolo Canyons. The information you submit is distributed to a 55places.com Partner Agent, who is a licensed real estate agent. The information regarding Campanas at Cibolo Canyons has not been verified or approved by the developer or homeowners association. Please verify all information prior to purchasing. 55places.com is not responsible for any errors regarding the information displayed on this website.